Scientists determined long ago that there is a direct causal link between smoking and ill-health for both smokers and passive smokers. Despite overwhelming evidence, some stakeholders continued to peddle doubt regarding the health implications until this false contention was no longer tenable. Research has also shown that tobacco control regulations, such as higher taxes, bans on smoking in public places, advertising bans, purchaser age restrictions, and plain packaging reduce tobacco consumption rates, and thus positively impact human health. Although the evidence for this is conclusive, some stakeholders continue to sow doubt, especially related to the impact of newer regulations, such as plain packaging, on reducing smoking levels. Opponents of tobacco control also emphasize the non-public health implications, particularly the supposed impact on illicit trade. There is an incentive for certain stakeholders to exaggerate the volume of illicit trade in tobacco, in order to garner resources or to lobby against public policies that result in decreased profits. Also, misleading or false pronouncements are aided by data limitations: illicit trade is difficult to measure because smugglers are not ‘eager’ to supply data. Peer-reviewed research, however, generally concludes that although, all things being equal, tobacco control policies such as higher taxes can in some circumstances partially contribute to modest short-term increases in illicit trade, it is not a major factor, and that illicit trade can be better curtailed by policies that strengthen law enforcement and reduce government corruption. 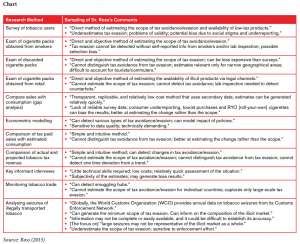 Many examples show that a robust Customs game plan which targets the illicit trade in tobacco, coupled with anti-corruption strategies where necessary, can result in lower illicit trade commensurate with the impact of the implementation of higher tobacco taxes and other tobacco control regulations. In their 2011 peer-reviewed paper ‘From cigarette smuggling to illicit tobacco trade,’ tobacco control experts Luk Joossens and Martin Raw defined tax avoidance as the “purchasing in lower tax jurisdictions of tobacco products by individual tobacco users residing in high tax jurisdictions for their own consumption, within Customs constraints.” Thus, tax avoidance is not per se an illegal activity. A more recent example is a tweet by British American Tobacco (BAT) on 24 November 2015, which stated “Excise increases equal #illegaltobacco growth.” The tweet linked to a BAT media release criticizing the Australian Government’s increase in tobacco excise taxes. In reality, peer-reviewed research and Australian government data indicate that the illicit trade in tobacco has not increased in tandem with higher tobacco taxes and ‘plain packaging’ in Australia, while smoking rates have declined and revenue collection has increased. Unwarranted fears of illicit trade have occasionally influenced governments to reduce tobacco taxes, which in turn increases tobacco consumption and tobacco-related diseases, while reducing revenue collection. Actions by the governments of Canada and Sweden in 1994 and 1998 respectively are prime examples of this. In both countries, tobacco tax increases led to lower smoking rates and higher revenue collection. However, fears about increased illicit trade and political pressure led the governments to reduce the tobacco tax rates, resulting in an increase in smoking rates and a decline in revenue collection. Interestingly, evidence is presented in Rob Cunningham’s book that in Canada in the 1990s, the rise in illicit trade occurred as a result of Canadian tobacco companies massively increasing exports of Canadian cigarette brands to the United States for which there was virtually no demand, and which were then smuggled back into Canada where demand was high. It seems almost intuitive that implemented public policies that reduce tobacco consumption would also contribute to lower illicit trade in tobacco, especially over the long-term. If lower initiation, higher cessation, and lower intensity consumption levels ensue for tobacco products compliant with tax regulations, those who quit or never start will also have less demand for tobacco products that are non-compliant with tax regulations. Of particular importance for consideration are (1) the research methods for measuring the illicit trade in tobacco, and (2) the criteria for evaluating the reliability of papers that present findings on the quantification of the illicit trade in tobacco. Dr. Ross discusses at length criteria for evaluating the quality of papers on illicit trade. Papers submitted for peer-review which survive the process maintain their credibility, while those that are not formally scrutinized by independent experts do not. In addition, the funding source (if any) should be disclosed – in striving for objectivity and accuracy, it is essential that funding does not come from vested interests expecting a pre-ordained conclusion. In her guide, while noting the difficulties in obtaining reliable data, Dr. Ross summarizes many of the methods that have been used for measuring the illicit trade in tobacco. She recommends that in striving for the most reliable analysis, it is advantageous for researchers to triangulate (combine different research methods and cross verify from other sources) and to focus on papers that comply with the basic tenets of objective research. 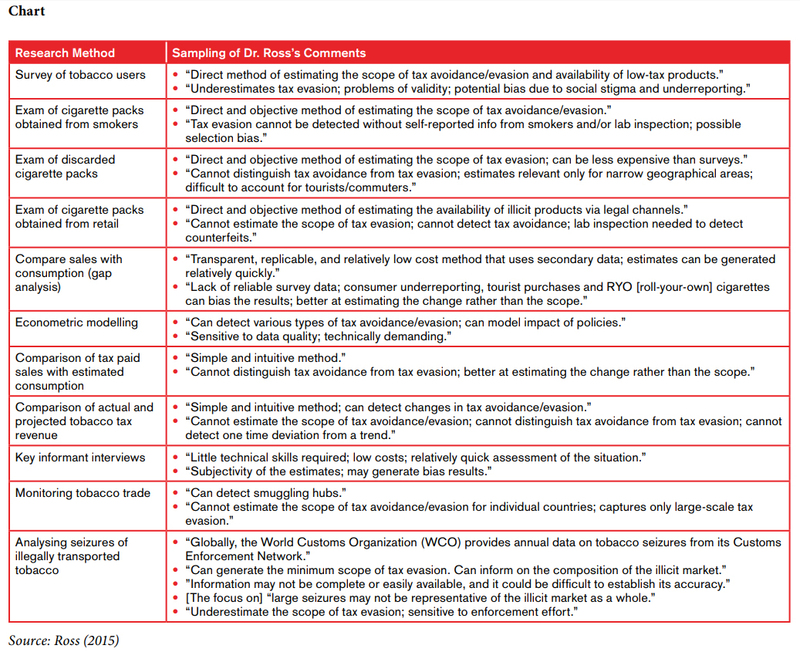 The chart in this article summarizes the 11 tobacco illicit trade research methods discussed by Dr. Ross and a sampling of her comments. Elaboration on the research methods she describes can be accessed at https://tobacconomics.org/research/understanding-and-measuring-cigarette-tax-avoidance-and-evasion-a-methodological-guide. A perfect method or methodology by which to measure the illicit trade in tobacco does not exist. Any study that contends that one particular methodology can make a definitive conclusion concerning the measurement of illicit trade should be disregarded. By using several methods that comply with objective research rules, reasonable estimates can in some settings be made. Moreover, illicit trade cannot be viewed in isolation; smoking rates and revenue collections from tobacco taxes are not only easier to measure, but are vital matters for public policy.